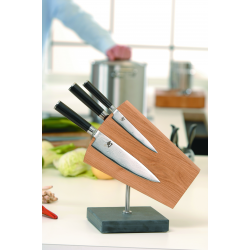 Knife blocks are ideal for safe storage of your knives. In addition, a knife block also look very cool on the kitchen counter. They are available in different designs, such as a magnetic knife blocks or with slots, for wall mounting or rotating knife blocks. Wooden knife blocks are manufactured to meet the highest demands in terms of quality and design. These wonderful products are skilfully produced to the highest level. Large requirements relate not only to design and functionality but also to the quality of the original wood. Sustainability and environmental responsibility are equally important to the beauty and variety of different types of wood. The durability of the products corresponds to the life cycle of the wood used. This means that the raw material for the products may increase again during use. DescriptionUsing the magnetic knife block by Kai Shun, you make your knives a showpiece in the kitch..
DescriptionOak wood in-drawer knife organizer. The safe and convenient way to store your kitchen kni.. Magnetic knife board (without knives). With the help of a magnetic system the knives are fixed to th..
DescriptionAluminium polished magnetic knife block from darkbrown leather for 8 knive..
DescriptionAluminium polished magnetic knife block from light brown leather for 8 kni..
DescriptionMagnetic knife block with room for 10 knivesSpecificationsBrand: KaiType: knife blockFill..
DescriptionMagnetic knife block made of oak and stainless steel, has room for 10 knivesSpecification..
DescriptionMagnetic knife block made of walnut and granite, has room for 10 knivesSpecificationsBran..
KAI STH-4.1, KNIFE BLOCK STONEHENGE, STAINLESS STEEL/WALNUT FOR 4 KNIVES, 18/ 10/ 28 CM L/W/HSpecifi..